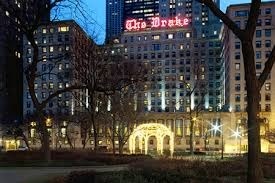 From its beginning on New Year's Eve 1920 to the present day, The Drake Hotel has been a purveyor of excellence in hospitality. Set in the prestigious Gold Coast neighborhood at the start of the Magnificent Mile, our fantastic location is just footsteps from Oak Street Beach and Lake Michigan. Inside you’ll find a hotel steeped in tradition. Iconic dining venues and elegant guest rooms combine with modern facilities for recreation, relaxation and business — everything you need for a remarkable stay in Chicago. 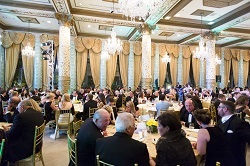 The Drake Hotel has a special room block for the Gala, if you are in need of a room please click on this link - https://resweb.passkey.com/Resweb.do?mode=welcome_gi_new&groupID=52957170 or by call 1-800-55-DRAKE and mention the Arthritis Foundation Gala when you book your room. The block of rooms is being held until September 2 at the rate of $259 per room/night. From the North/Northwest: Follow I-90/94 East towards Chicago. Exit at Ohio Street/ Exit # 50B (One-way Eastbound). Follow Ohio Street 3/4 mile to Michigan Avenue. Turn left (North) onto Michigan Avenue. Go eight blocks North, turn right at Delaware Street. Take first two left turns to circle the block and you will arrive at the main Walton Street entrance. There is valet parking available as well as lots surrounding the hotel. From the East: Follow I-90/94 West towards Chicago, (Dan Ryan Expressway). Exit at Ohio Street (One-way Eastbound). Follow Ohio Street 3/4 mile to Michigan Avenue. Turn left (North) onto Michigan Avenue. Go eight blocks North, turn right at Delaware Street. Take first two left turns to circle the block and you will arrive at the main Walton Street entrance. There is valet parking available as well as lots surrounding the hotel. From the West: Follow I-88 East to I-290 East towards Chicago. I-290 becomes the Congress Parkway. Turn left onto Michigan Avenue. Go North on Michigan Avenue two miles and turn right onto Delaware Street. Take first two left turns to circle the block and you will arrive at the Walton Street entrance. There is valet parking available as well as lots surrounding the hotel. From the South/Southwest: Follow I-55 (Stevenson Expressway) or I-57 North to I-94 West towards Chicago. Exit I-94 at Ohio Street (One-way Eastbound). Follow Ohio Street 3/4 mile to Michigan Avenue. Turn left (North) onto Michigan Avenue. Go eight blocks North, turn right at Delaware Street. Take first two left turns to circle the block and you will arrive at the main Walton Street entrance. There is valet parking available as well as lots surrounding the hotel.